Sir Gallahad by Isabey: launched in 1924. Originally a perfume for women. May have been a competitor to Ciro's successful perfume Chevalier de la Nuit (Night of the Knight) from 1923. So what does it smell like? I have no published notes on this fragrance. If this is a competitor to the Chevalier de la Nuit fragrance, it may have smelled similar. Chevalier de l Nuit had notes of tuberose, gardenia and jasmine. 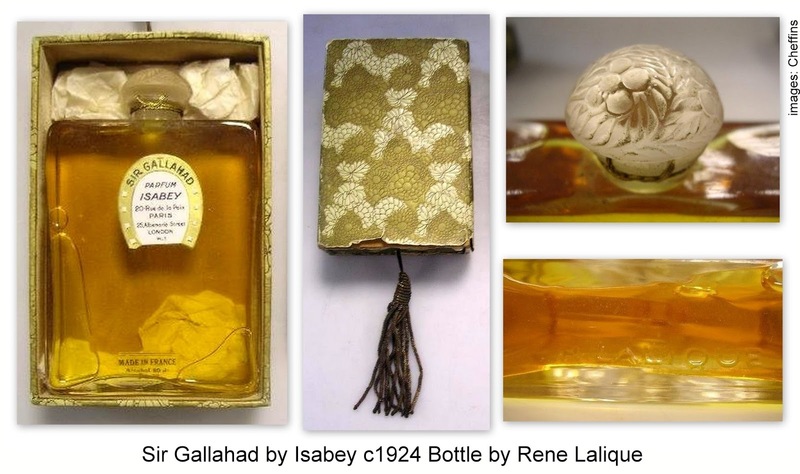 Sir Gallahad was presented in a simple clear glass perfume bottle with frosted floral stopper by Rene Lalique. The bottle is molded with "R. Lalique." This bottle was also used for other Isabey perfumes: Chypre Celtique, À Travers la Voilette as well as for the Marcel Guerlain perfume, Ambre. Discontinued, date unknown. It was still being sold in 1927. 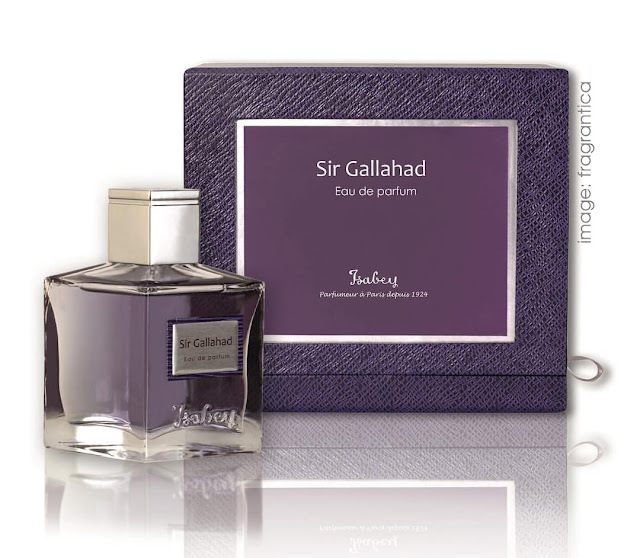 The resurrected Parfums Isabey company (which by the way, makes excellent perfumes) has released Sir Gallahad, this time as a scent for men. The newly made Eau de Parfum debuted in 2017 and is classified as a woody fragrance for men with notes of woods, tobacco and flowers. The cologne was created by Takasago perfumers Jean Jacques and Catherine Selig. I am unsure if this new fragrance has any connection to the original 1924 as I do not have the notes for the antique version.